With its perky, bright green foliage that looks like lucky four-leaf clovers, shamrock (Oxalis spp.) is a popular St. Patrick's Day gift. 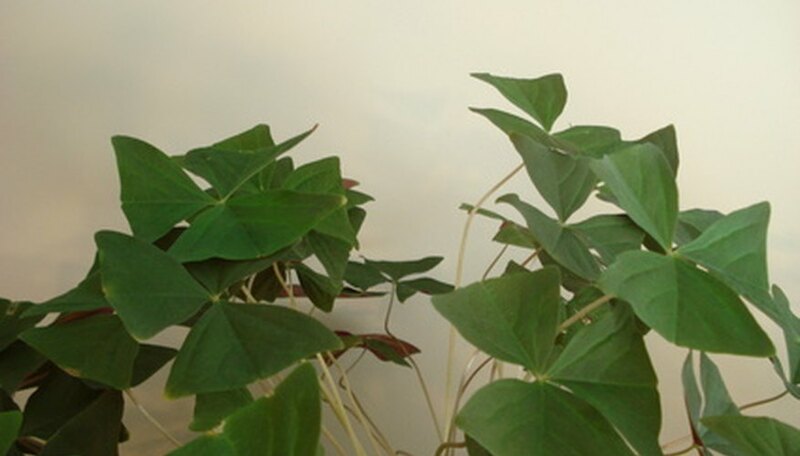 Shamrock makes a delightful indoor plant that will thrive for years with minimal care. If conditions are right, a shamrock plant will brighten your indoor environment with plenty of dainty blooms that grow on graceful, slender stems during spring and summer. Shamrock is easily propagated by dividing the plant's tuberous roots, or corms. Divide shamrock when the plant begins to show new growth, which indicates that the plant is just beginning to emerge from its dormant period in early spring. Prepare a planting container for the divided shamrock corms ahead of time. Use a container with a drainage hole in the bottom. Fill the container with a mixture of half commercial potting soil and half sand. Remove the entire shamrock plant carefully from its container. Pull off the small corms that are growing to the side of the roots. Plant the corms in the new container with the top of the corms just under the surface of the soil. Place the container in bright, indirect light. Avoid placing the plant near a hot, sunny window or a window with southern exposure. Water the shamrock lightly as needed to keep the soil slightly moist to the touch. Don't allow the soil to become dry. Water the shamrock lightly as needed to keep the soil slightly moist to the touch. Don't allow the soil to become dry. You can plant shamrock corms outdoors in moist, well-drained soil and partial sunlight. However, shamrock can often grow out of control and for that reason is usually grown as an indoor plant.